Heavy rainfall gave birth to many of the craters and valleys on both the celestial bodies. Although there has been alleged evidence of presence of water on Mars, it does not receive rains today. The Mars witnessed heavy rains billions of years ago that may have led to the reshaping of the red planet’s surface or the impact craters and created river-like channels billions of years ago, according to a new study. 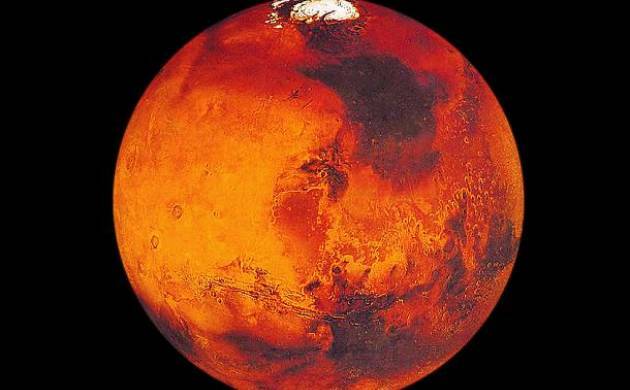 According to scientists, Mars received heavy rainfall due to the changes in its atmosphere and the effect on the red planet was similar to that seen on the surface of the Earth. Mars, which is the fourth planet from the Sun, has geological features like the Earth and Moon such as craters and valleys. Rainfall gave birth to many of the craters and valleys on both the celestial bodies. Although there has been alleged evidence of presence of water on Mars, it does not receive rains today. Robert Craddock and Ralph Lorenz from Johns Hopkins University in the US have shown in the study that the planet once received rainfall in the past and it was so heavy that it changed the surface of the planet. The Valley networks seen on Mars make the surface runoff driven by rainfall evident. “Many people have analysed the nature of rainfall on the Earth, but no one had thought to apply the physics to understanding the early Martian atmosphere,” said Craddock. The researchers had to consider how the atmosphere of Mars has changed in order to understand how the rains on the red planet changed over time. 4.5 billion years ago when Mars was first formed, it had much more substantial atmosphere with a high pressure compared to what it does now. The size of the raindrops and how hard they fall is influenced by this pressure. The water droplets would have been very small during the early existence of the planet and they would have produced something like fog and not rain. This would not have been capable enough of carving out the planet we know today. Over millions of years, as the atmosphere pressure decreased, the raindrops became bigger and rainfall turned heavy enough to cut into the soil and began to alter the craters. The water could then be channelled and able to cut through the planet’s surface, creating valleys. “By using basic physical principles to understand the relationship between the atmosphere, raindrop size and rainfall intensity, we have shown that Mars would have seen some pretty big raindrops that would have been able to make more drastic changes to the surface than the earlier fog-like droplets,” said Lorenz. the atmospheric pressure on Mars would have been about 4 bars (the Earth’s surface today is 1 bar) very early on, said researchers. The raindrops at this pressure could not have been bigger than three millimetres across, which would not have penetrated the soil, they said. The droplets could grow and fall harder, cutting into the soil as the atmospheric pressure fell to 1.5 bars, the droplets could grow and fall harder, cutting into the soil. Had the pressure been the same as we have on Earth in Martian conditions at that time, raindrops would have been about 7.3 millimetres - a millimetre bigger than on Earth. “It’s unlikely that rainfall on early Mars would have been dramatically different than what’s described in our paper. Our findings provide new, more definitive, constraints about the history of water and the climate on Mars,” said Craddock. The study was published in the journal Icarus.